We all know that Sensex tested the level of 8,000 during march 2009, the correction due to global turmoil and US recession was so intensed and fearful that Indian stock market came down to 8,000 from level of 21,000 in span of 14 months. Severe correction of more than 60% from highs of Jan 2008 to lows of March 2009. If you have invested in fundamentally strong small and mid cap stocks during march 2009, you have made huge money out of stock market. Let us see how? Just one example: Yes Bank touched low of Rs. 43 during that period is trading at Rs. 300 now, its a good mid cap stock in banking sector giving more than 6 times returns. And believe us there are many stocks like Yes Bank. Remember, an opportunity missed is an opportunity lost! You have the similar opportunity to get the maximum benefits by availing our Super Saver Diwali Offer of the year. In these 24 hours, you can steal the best deal by subscribing to our annual subscription services, a simple way to grow your savings by making educated investment decision. Authentic and unbiased research reports published by our equity analysts will support your decision of investing in Hidden Gems & Value Picks stocks. Now you can also manage your portfolio like a professional with our WEALTH-BUILDER service. In next 24 hours, you can save upto 45% after which this opportunity will disappear. Saral Gyan Super Saver Diwali offer will close on 4th November 2011 at 8.00 pm. Highlights of the Offer ! Portfolio of Hidden Gems, Value Picks & 15% @ 90 DAYS stocks.
" How to Grow your Savings?" 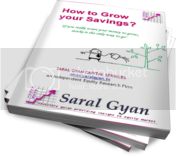 Get eBook "How to Grow your Savings?" worth Rs. 499, [$ 11.99] Absolutely Free! Note: Saral Gyan eBook will be mailed to subscribers on confirmation of their subscription during offer period. Under Super Saver Diwali Offer, subscribers will get a Deepawali Muhurat Buy - One lakh rupee portfolio of 10 stocks of small and mid cap stocks. Saral Gyan suggested portfolio will contain best of past recommended Hidden Gems & Value Picks. Note: Eligible subscribers will get the Saral Gyan 1 lakh rupee portfolio on activation of their subscription under this offer. So what are you waiting for, grab the best deal. Subscribe to avail the best offer of the year! You can pay using credit card, online transaction using NEFT or by cheque. Click here to view bank details and payment options.